Maine, the northern-most state on the east coast of the U. S., has average low winter temperatures between minus 35 and minus 10 degrees Fahrenheit. Despite its cold (and long) winters, Maine has an ideal climate in which to grow several cherry tree varieties, including the black cherry, early Richmond cherry, sandcherry western and Nanking cherry trees. The best time to plant cherry trees in Maine is in the spring. Select a cherry tree suitable for Maine’s climate. Maine is divided into U.S. Department of Agriculture plant hardiness zones 3 to 5. Choose a tree that is winter hardy in your zone. Plant your cherry tree in a location that gets full sun. In Maine, your cherry tree needs the most sunlight you can offer. Allow ample room that is free from obstacles, including power lines, for the tree to grow to its mature height and width. Dig your shovel into the soil in spring when the ground has thawed and the soil has recovered from Maine’s snowy winter days. If it comes out with clumps of wet soil, the soil is too wet to plant a cherry tree and you’ll have to wait a bit longer. Keep your tree’s roots moist during this time. Dig or rototill an area 12 inches deep and two to five times as wide as the tree’s root ball to loosen the soil so the roots will thrive. Dig a hole n the center that is twice as wide, but just as deep as the cherry tree’s root ball. Amend the soil if your soil does not drain well (e.g., puddles remain after five hours of hard rain). It may be high in sand or clay, as is common in many areas of Maine. If so, mix up to 50 percent peat moss into the original soil to create a rich, loamy, well-drained soil. Remove your tree from its container. If the roots are growing circles around the outside of the soil, your cherry tree is root bound. Take a utility knife and cut four vertical slits down the sides of the soil to cut through those roots so they don’t continue to grow in this pattern. If your tree came bare rooted, skip this step. Set the tree in the middle of the hole. If necessary, adjust the depth of the hole by removing the tree and filling the hole with more soil, or by removing some soil. 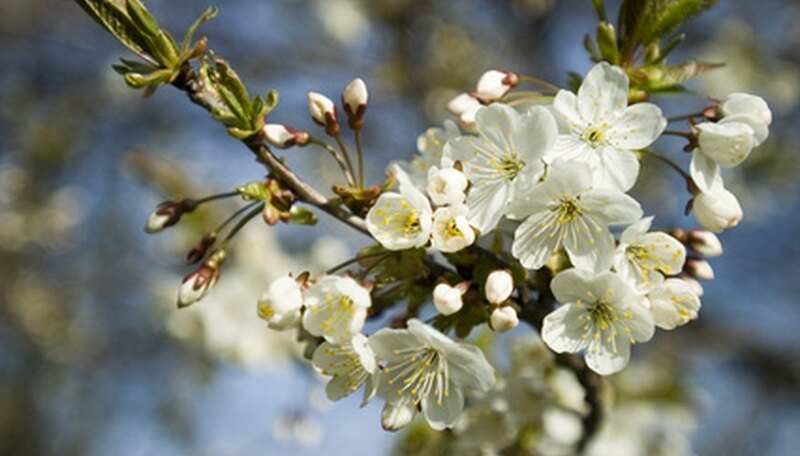 When the tree is planted, the cherry tree’s graft union should be 2 to 3 inches above the ground. If your tree was not grafted, plant it just as deep as it was planted in the container or deep enough to accommodate the roots of a bare root tree. Form a mound of soil in the middle of the hole to set the tree on and for the roots to spread out and over. Spread out the roots of a bare root tree, if applicable. Do not let them go up the sides of the hole, so dig the hole deeper and wider, if necessary. Straighten the tree and backfill the soil into the hole, packing it down with your hands as you go. Pack the soil firmly with your feet when finished and water your newly planted cherry tree with about 3 gallons of water. Always handle the tree near the bottom of the trunk.